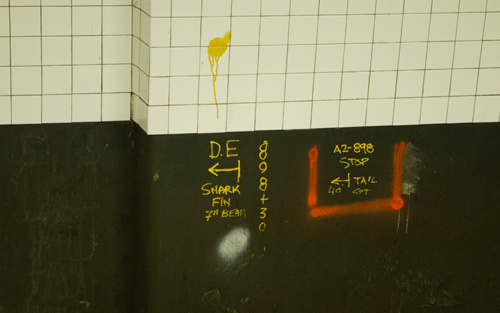 I thought it was only crocodiles, but apparently sharks are a part of NYC Subway ecosystem. One of the skills that you learn as a New Yorker is tuning out the mentally ill or simply obnoxious people, with cell phone headsets or without, who constantly assault your hearing. As tuning out a subway preacher who constantly modulates her voice is next to impossible, I usually carry a pair of earplugs in my bag. Yesterday, as I was riding the Brighton line while reading an interesting book, a man sitting a couple of seats from me began ranting. Looking like Isaak Asimov in his later years, but more disheveled, the dude had a voice of a PBS announcer. A couple of minutes into the rant, I suddenly realized that he was talking about something rather familiar to me — the history of the BMT and BRT, and the Malbone Street Wreck in particular. 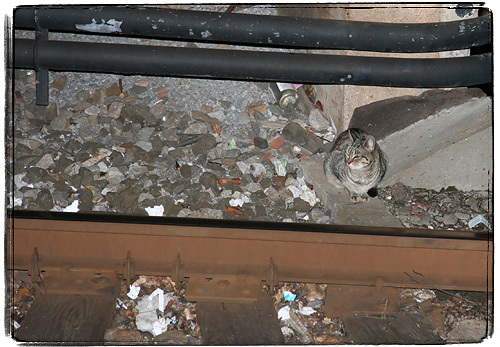 The Malbone Street Wreck was the worst subway disaster in New York’s history. 93 people perished in a horrible crash caused by Edward Luciano, a crew dispatcher pressed into service as a motorman during a subway strike. He hit an S-curve designed for 6mph at 30mph. I happened in 1918, when the trains were still made out of wood and there were only 4 cars in a train. The first and fourth cars survived the crash mostly intact, but the middle two cars derailed and slammed into a tunnel wall under Malbone street. As the unwelcome subway tour guide was pointing out, we were passing by what used to be Malbone Street, but is now called Empire Boulevard. The street was renamed because of the accident, kind of to dim the memory of the crash. What is even more disturbing, there is no memorial at the station where this happened. Well, at least I don’t remember seeing one. 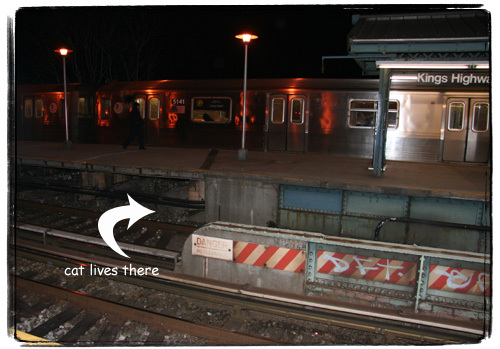 All these years I mistakenly thought that the crash happened somewhere on the 2 line, nearer to Brooklyn College. I guess it took a disturbed man’s rant to set me straight on the matter. In New York City we pass through places where horrible tragedies happened. My wife had classes at what is now known as the Brown Building of Science. I spend a lot of time fishing at a place where 10 illegal immigrants drowned trying to reach the shore in the Golden Venture incident. There’s a place in the Empire State Building where a B-25 bomber crashed into it, killing 11 people. I still shop at the Staples store that was built in place of a Waldbaums supermarket where 6 firemen perished. And everybody knows what the horrible emptiness in New York’s skyline means. The fabric of the city closes around disasters, some sooner than others. But the ghosts will not let you forget them. They still lurk in the shadows, whisper their stories to you as you pass by. As the subway ranter finished his rant, a young man wearing a hoodie with a Donny Darko-like skeleton on it sat down next to him. I took a picture of the two of them with my Treo, but all of my Treo photos got destroyed during the software update that I did today. I am considering buying a minidisc recorder or one of those iPod add-ons in order to be able to post little snippets of unusual sounds that I encounter, especially snippets of subway performer music. 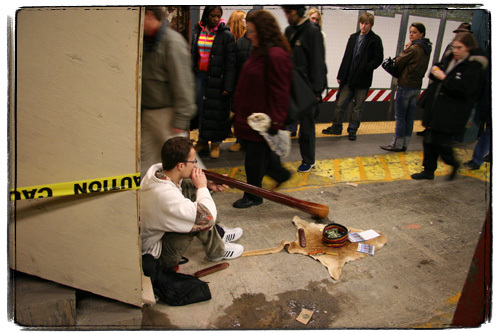 From what I can tell, this guy is a pretty good didgeridoo player. Also, it’s one of the few instruments that allows the performer to say “thank you” through the instrument. Well, that must have been the funniest “thank you” that I ever got from a subway performer for my buck. Now, this guy is probably the worst pan (pronounced “pon”, like “man” is pronounced “mon”) player. I don’t usually give money to sub-par players, but this guy was the worst of the worst. 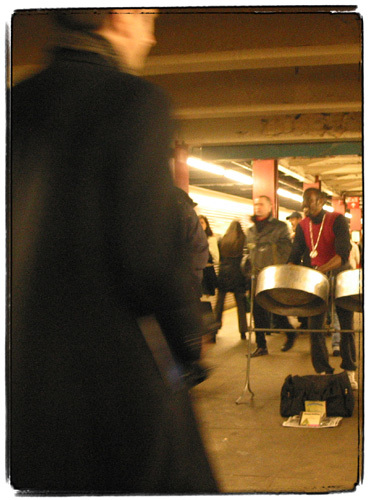 He did get my dollar for what must be the most terrible steel drum rendition of “Hava Nagila” I’ve ever heard. And I’ve heard a few. As a side now, in the subway “Hava Ngila” is one of the main money makers for hacks. Also you get to hear a lot of Pink Panther Theme, Jeopardy! Theme aka “Think Music” and Katyusha. It’s kind of fun to hear these on exotic instruments like “musical saw”, but more often then not it’s a nuisance.